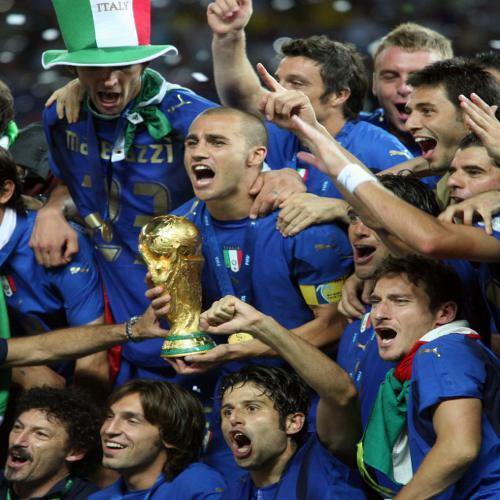 Photo: Italy celebrates with the 2006 World Cup trophy. 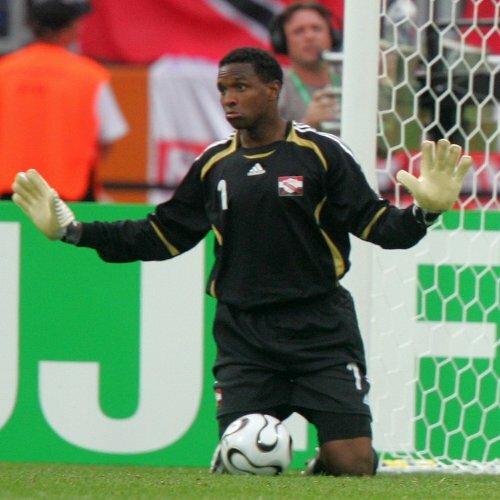 Kelvin Jack will always be remembered for being in possession of the number one shirt when Trinidad and Tobago made history by qualifying for the 2006 World Cup. So Dennis Lawrence stole the headlines with his unforgettable header against Bahrain in Manama. But just as crucial for the “Soca Warriors” was Jack’s acrobatic last minute save that booked the two island republic’s World Cup berth. It is definitely seeing Ronaldo—and I’m talking about The Phenomenon—lifting the World Cup. I’d always followed the Brazilian’s career from PSV Eidhoven all the way to his last move back to Brazil. This is a guy who tore his patellar tendon twice yet he was able to be the World Player of the Year on three occasions. That takes incredible determination and mental strength. I know a bit of his struggle first hand as I had tendinitis and a small tear in my patellar; and it is a quite serious injury. I’ve heard many people call him lazy and they don’t know what they are talking about. You don’t have the kind of success he had and overcome such serious injuries along the way by being lazy. 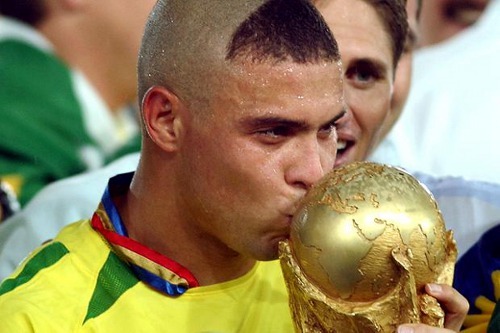 Brazil legend Ronaldo gets intimate with the 2002 World Cup trophy. He is a champion and he is a player I looked to for inspiration when I had to deal with my own injuries. Without question, Ronaldo is the greatest centre-forward of the last 30years; quick, strong, mentally sharp, technically perfect and his finishing was imperious. For me, seeing him lift the World Cup in 2002 after his problems in the 1998 final was sensational and a sight to behold. 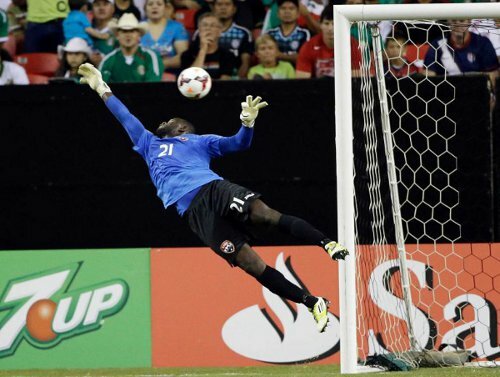 Photo: Central FC and Trinidad and Tobago goalkeeper Jan-Michael Williams established himself as one of CONCACAF’s top goalkeepers in 2013. Williams explained that, as an 18-year-old upstart, he first chose 21 out of deference to then Connection custodian Alejandro Figueroa and Trinidad and Tobago goalie Clayton Ince who both wore 1 on their backs. Then, once established himself, he decided to make 21 the new trend instead for the next wave of local goaltenders. I’m an Italian fan to my heart, so my favourite team would have to be Italy’s 2006 World Cup squad. Not only did they win; but the only goal (from open play) that they conceded for the entire tournament was an own goal. Photo: Germany midfielder Michael Ballack (second from right) tries to get his free kick past a wall of Italian defenders during the 2006 World Cup. I loved the passion they showed defensively and for each other. I remember (Mauro) Camoranesi’s promuse to cut his hair if Italy won; and he was born in Argentina! I think that said a lot about their togetherness. People talk a lot about talent, skill and structure and many times I find that coaches overlook passion, attitude and determination. That Italian team had it. Shaka Hislop will go down as Trinidad and Tobago’s most successful goalkeeper. He was once the England Premier League’s most expensive goalkeeper while he spent almost a decade in the top flight with Newcastle, West Ham and Portsmouth. 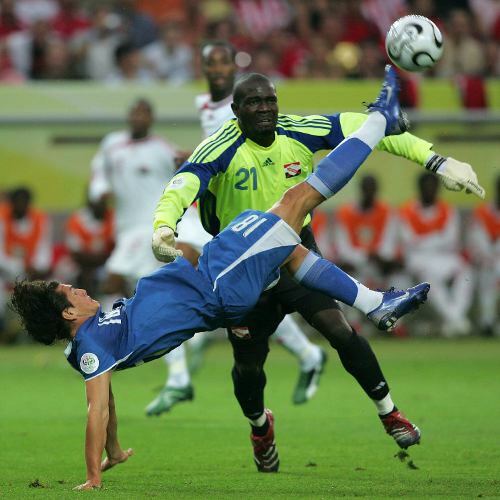 And, of course, he was in goal when the “Soca Warriors” made its dramatic 2006 World Cup debut with a goalless draw against Sweden in Dortmund. He is regarded as the best ever, and with good reason. That save from Pelé still takes my breath away. (Click HERE for clip of Banks’s famous save against Pelé). I grew up to stories of Banks’ heroics and as a young goalkeeper he somehow had an amazing influence on my own ambitions… So maybe I’m a little biased here. 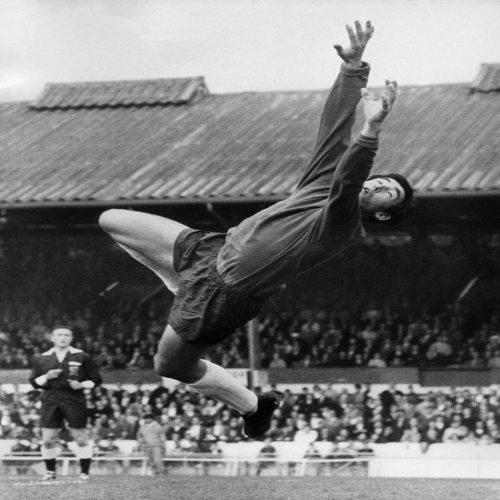 Photo: Legendary former England goalkeeper and World Cup winner Gordon Banks. The “Kaiser” was easily the best centre-back to have played the game. There is literally nothing that Franz Beckenbauer could not do. As complete a player as you will ever find. A wonderful reader of the game; regarded as one of AC Milan’s and Italy’s all-time best ever footballers. There hasn’t been a better left back in the game. He had the same attacking prowess of a Roberto Carlos but was far more talented on the ball than anyone before or since. There may have been better defenders in that position; but no one better at both ends of the pitch. I was tempted to go with Brazil’s Carlos Alberto as my right back. But, here comes my bias again, Moore, as a West Ham legend, had to get the nod. The fact that he was more highly thought of by his teammates and those he came up against than fans of the game tells its own story. The man who Pelé referred to as the best defender he ever came up against had to be in my XI. 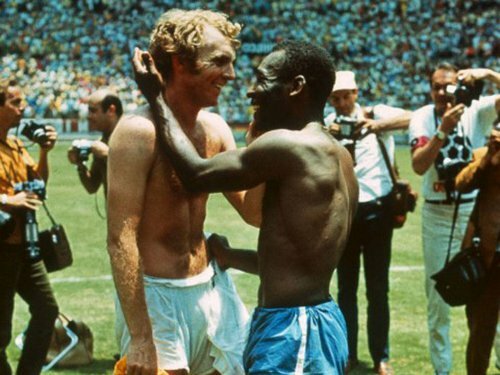 Photo: Late England World Cup captain and West Ham legend Bobby Moore (left) exchanges pleasantries with Pelé in this iconic photo. One of the few players I’d pay good money to go see run up and down with ball at his feet in an otherwise empty football field. 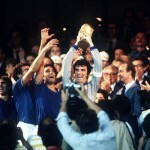 He had grace and talent like few others; and the ability to drag an otherwise failing French team, to glory. He is one of my personal favourites of all time. Is there anything Zico could not do? Deadly from set pieces, as good a passer of the ball as the game has ever seen, and would embarrass you at a heartbeat if anyone got a little too zealous in their tackling in midfield. 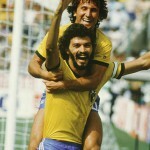 With Socrates alongside him, Zico made Brazil tick in the late 1970’s and early 80’s. Do I really need to explain this selection? Really?! First, he claims that God himself lent a hand in scoring the opener against England in ‘86. Then, as if just to prove that he really had God on his side, he goes and scores what is probably the best goal in World Cup history, with a run that seemed to start in Guadalajara even though the game was played in Mexico City! 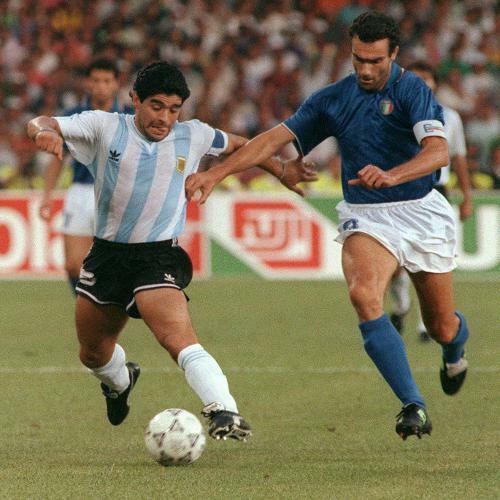 He followed that up with what was undeniably the best individual effort in getting a below-average Argentina to the final in 1990. Way, way, way ahead of his time. He transformed the way the game was played, how it was coached and even players’ role in endorsing and marketing the game. He led the Dutch to the final in 1974, but sadly, Johan Cruyff never won a World Cup title. A new arrival couldn’t believe his eyes during pre-season one year, screaming “Run, you fat [expletive]!” at Ronaldo as he ambled about. Ronaldo told him to piss off. Photo: Caledonia AIA players celebrate at the expense of Jan-Michael Williams (right) during the goalkeeper’s stint at St Ann’s Rangers last year. The rest of the players can commit a terrible blunder here or there, but they erase it again with some spectacular dribbling or a masterful pass but the goalkeeper can’t do that. The crowd won’t forgive the goalkeeper anything. Editor’s Note: Click HERE to enjoy more of our World Cup stories; or scroll down to share your own memories and predictions with us. As a football fan, I was sad to see Ronaldo go. 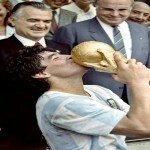 As an Argentine football supporter, I was relieved when he was no longer around to terrorise “our” defenders!